Bonded through tragedy, united in hope; the Catholic Church & East Timor’s Struggle for independence. A memoir. More than 200 people at the Knox Centre in Melbourne on 1 June heard Bishop Vincent Long OFM Conv, now of Parramatta Diocese, launch this striking account of Bishop Hilton Deakin and his involvement with the struggles in East Timor. Written by prominent educationalists Therese D’Orsa Professor of Mission & Culture at the Broken Bay Institute in Sydney, and her husband, Dr Jim D’Orsa, in close collaboration with Hilton, Bonded through Tragedy, United in Hope, chronicles how Hilton became deeply involved in the saga of East Timor, and played such an important role supporting key figures in the independence movement, and communicating with an international audience about what was happening in Timor L’Este. The book explains how his upbringing and research work as an anthropologist in Aboriginal culture helped prepare Hilton for this remarkable role, and equipped him to head Caritas Australia and land in crisis situations like that in Rwanda. MC for the evening, Ms Joyce Loh executive assistant to ACU’s Associate Vice-Chancellor Victoria John Ballard, introduced Ms Vicki Clark for the acknowledgement of country. Vicki is a Mutthi Mutthi woman, who for 25 years was the coordinator of Aboriginal Catholic Ministry Victoria, and a vigorous advocate for Indigenous peoples. She thanked Hilton for his unwavering support for her as a prominent voice for Aborigines, and especially as an advocate through Catholic and other schools and social networks in Victoria. Ms Sandy Nagy followed Vicki, and spoke of how it was the significance of this book which convinced Garratt Publishing to print and promote it. Director of the Yarra Institute for Religion & Social Policy Fr Bruce Duncan explained that the Board members of the Yarra Institute considered that, among their various projects, Hilton’s story had to be told. They asked Therese and Jim D’Orsa if they would write it in association with Bishop Hilton. Though very busy with other writing projects, research, and teaching, they agreed to do so, and for the next five or six years spent many days travelling up and down from their home in Warragul to interview Hilton extensively, and collect and sort the many documents and letters he had kept. The D’Orsas undertook this entirely pro bono, since the Yarra Institute was unable to find funding for this book. Bruce specifically thanked Ms Anne Doyle for her expert proofreading of the final draft, also completed pro bono. He also thanked Elizabeth Proust for a donation to fund Jim D’Orsa’s travel around East Timor to familiarise himself with places and people. Another donor, who wished to remain anonymous, made a generous contribution to the publication. Finally, Bruce thanked Professor Ballard, Joyce Loh, and ACU for making their theatre available for the launch, and Dekki Woirei for the IT arrangements. He also thanked the Archdiocese for the use of the Knox Centre, and for covering the costs of the East Timorese meal. Bishop Vincent Long formally launched the book. He spoke of his admiration for Hilton in his advocacy for and involvement in East Timor and in Caritas Australia, the Church, and its social commitment. He said Hilton had been something of a mentor to him after he was made auxiliary bishop in Melbourne in 2011. In his foreword to the book, Bishop Vincent wrote that ‘Hilton Deakin’s story has been largely unknown, but deserves to be celebrated as a remarkable contribution by an intrepid Melbourne priest and a Church leader who played a critical role in one of the most fraught crises in Australia’s recent history’. Bishop Hilton made a short response after Bishop Vincent, thanking all those who had journeyed with him over these years, especially those East Timorese and others who had endured great suffering. He thanked the East Timorese dancers, and the West Papua Womens’ Office in Docklands who had cooked some magnificent Timorese soup, served in coconut shells to everyone as they arrived, as well as Timorese tea and coffee afterwards. The Burundi Boys played skillfully with their unique band and music. He was especially grateful to Ms Louise Byrne, whose energy and verve brought this special event together. He also thanked Mr Jacob Rumbiak and members of the Australia West Papua Association for their involvement and support. 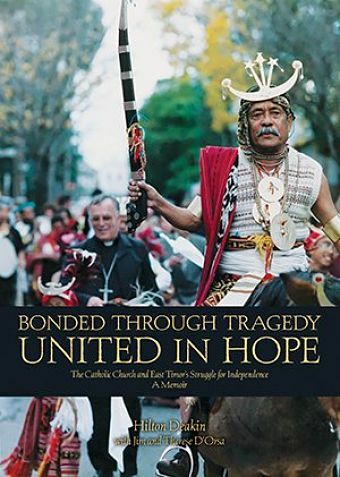 Bonded in Tragedy, United in Hope contains a foreword from Xanana Guzmao, the first President of East Timor (2002-2007), and fourth Premier of East Timor (2007-2015), and commendations from Professor Gabrielle McMullen, Ms Elizabeth Proust, Professor Frank Brennan SJ, Bishop Vincent Long, and Fr Richard Schroder SVD from Catholic Theological Union Chicago. Copies of the book can be purchased in Catholic bookstores, or directly from Garratt Publishing. RRP $29.95. Special price at Garratt $24.95 (or $20.97 for Sophia Club members), plus postage. Or Click here http://garrattpublishing.com.au/product/9781925073324/. Available also at the office of Social Policy Connections for $25, plus postage.